214 Commonwealth is located on the south side of Commonwealth, between Exeter and Fairfield, with 212 Commonwealth to the east and 216 Commonwealth to the west. 214 Commonwealth was built in 1879-1880 by Samuel T. Goldthwait & C. E. Chapin, masons, one of four contiguous houses (214-216-218-220 Commonwealth). As originally built, 214 and 220 Commonwealth were matching houses and 216 and 218 Commonwealth were matching houses. 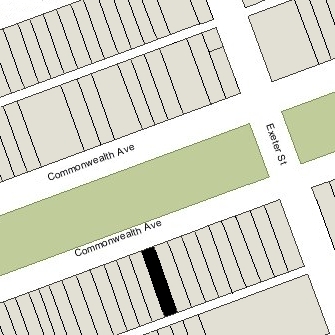 All four houses are shown as the being same height on the 1887 Sanborn map. Additional stories were added to 216 Commonwealth and 220 Commonwealth by the late 1890s, as shown on the 1898 Bromley map. The original permit applications for 214 and 220 Commonwealth are dated May 28, 1879, and do not indicate the architect; the permit application for 216-218 Commonwealth (one application for both houses), dated March 28, 1879, indicates Alfred S. Bither was the architect. It appears likely that he also designed 214 and 220 Commonwealth. Samuel Tarbell Ames, a building contractor, is shown as the owner of 214 Commonwealth on the original building permit application. It was built as the home of George Henry Quincy, who either engaged Samuel Ames to oversee its construction or purchased the house from him while it was under construction. 214 Commonwealth was built on a 24 foot wide lot, the eastern 22.5 feet on land originally owned by the Commonwealth of Massachusetts, and the western 1.5 feet on land originally owned by the Sears family. The western 1.5 feet was acquired on September 4, 1879, by Samuel T. Ames’s son, James Barr Ames, a Harvard law professor, who purchased it from George Henry Mackay. It was part of a 49.5 foot lot on which 216-218 Commonwealth were built for George Mackay, and included the eastern portion of the party wall between 214 and 216 Commonwealth. George Mackay had purchased the lot on April 7, 1879, from the National Bank of Commerce of Boston. It was part of a parcel the bank had acquired on May 18, 1876, from Nathan Matthews, which, in turn, was part of a larger tract originally purchased by Nathan Matthews on January 2, 1871, from David Sears, Jr., Frederick R. Sears, and Knyvet Sears. On November 21, 1879, George Quincy purchased the 1.5 foot wide strip from James Barr Ames. The 22.5 foot lot to the east was part of a 23 foot lot sold by the Commonwealth of Massachusetts at public auction in May of 1879. George Quincy either was the successful bidder or acquired the right to purchase the land from the successful bidder. He held the right to purchase the land by January 24, 1880, when he entered into an agreement to sell the eastern six inches, with the eastern half of the party wall between 212 and 214 Commonwealth, to Benjamin Munroe, who held the right to purchase the land at 212 Commonwealth. Click here for an index to the deeds for 214 Commonwealth. Construction of 214 Commonwealth was completed by June of 1880. However, George Quincy did not complete his purchase of the land from the Commonwealth until May 22, 1882, and did not transfer the six inch strip to Benjamin Munroe until June 18, 1885. By mid-1880, George Henry Quincy and his wife, Mary Caroline (Sweetser) Quincy, had made 214 Commonwealth their home. They previously had lived at the St. Cloud Hotel (Tremont opposite Union Park). He was a manufacturer of woolen machinery. Living with them at the time of the 1880 Census were their two sons and daughters-in-law: George Gilbert Quincy, a dealer in celluloid goods, and Maria Elizabeth (Salisbury) Quincy (who had married in October of 1878), and Charles Frederick Quincy, an agent for a dye manufacturer, and Ann (Etta) Molineux (Ives) Quincy (who had married in October of 1879). Soon thereafter, both couples moved to the Longwood district of Brookline. By the 1891-1892 winter season, Mary Quincy’s mother, Caroline Elizabeth (Cox) Sweetser, the widow of William Henry Sweetser. was living with them. She continued to live with them until her death in May of 1895. George Quincy also died in May of 1895, ten days after his mother-in-law. Mary Quincy continued to live at 214 Commonwealth. In 1895, she was joined by her sister, Dr. Ella Gertrude (Sweetser) Pease, the former wife of Dr. Giles Moseley Pease, and their son, Roger Quincy Pease. Giles Pease had been a surgeon during the Civil War and later practiced medicine in San Francisco. They were divorced in 1888 after he deserted her because of her refusal to refrain from wearing cosmetics. She subsequently attended the Hahnemann Hospital College in San Francisco, graduating as a homeopathic physician in December of 1891 (her former husband died the same month). She returned to Boston in about 1894 and first lived at 1 Worcester, where she also maintained her medical office. 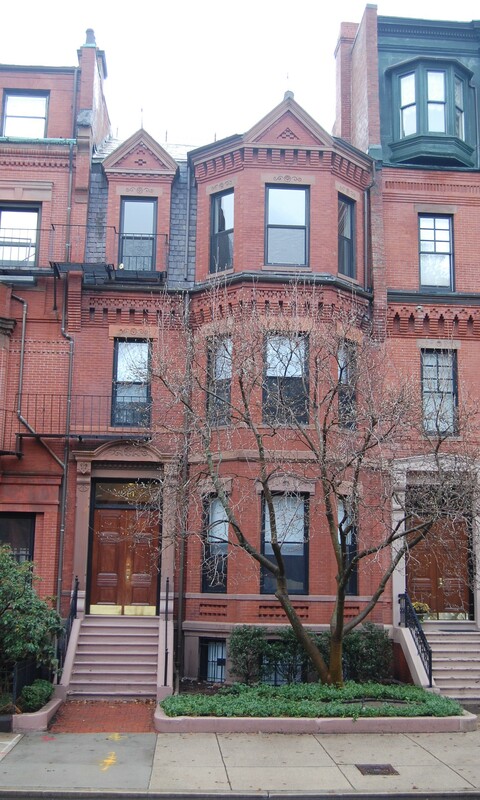 In 1895, she moved to live with Mary Quincy at 214 Commonwealth and opened an office at 601 Boylston. The next year, she moved her office to 214 Commonwealth. She continued to practice until about 1903. Roger Pease continued to live with his mother and aunt until shortly before his marriage in November of 1905 to Annie Louise Hopkins. After their marriage, they lived in Brookline. 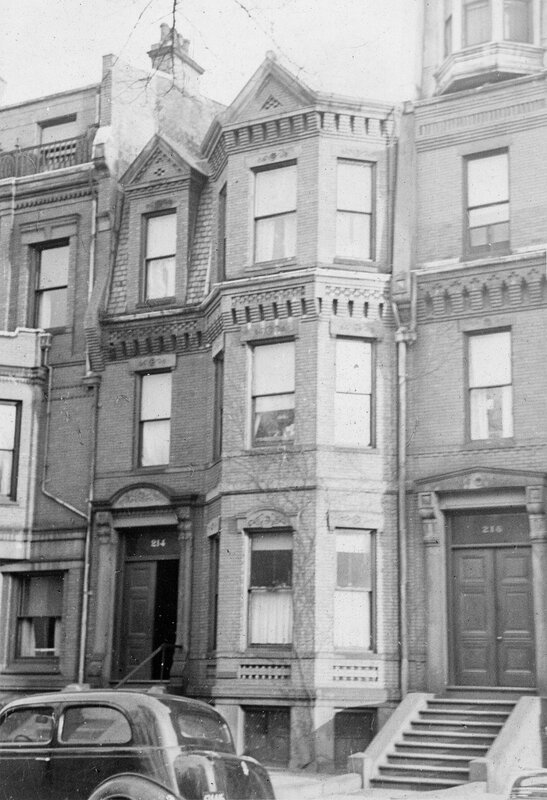 Mary Quincy and Ella Pease continued to live at 214 Commonwealth until Mary Quincy’s death in October of 1936. The house was not listed in the 1937 Blue Book and was shown as vacant in the 1937 Boston City Directory. On February 1, 1937, 214 Commonwealth was purchased from Mary Quincy’s estate by Helen E. Shea. On July 18, 1938, 214 Commonwealth was acquired from Helen Shea by Dr. Anthony Barone. He and his wife, Mildred (Knowles) Barone, made it their home. They previously had lived at 282 Hanover. Anthony Barone was a physician, dentist, and registered pharmacist. He and his brother, Joseph, had maintained their medical offices both at 342 Commonwealth and at 282 Hanover; after he acquired 214 Commonwealth, Anthony Barone moved his office there but continued to also maintain an office at 282 Hanover with his brother. In December of 1939, he applied for permission to convert the property from a single-family dwelling into a lodging house. Later that month, he withdrew the application, indicating that he “wished the status of it to remain as a one family house.” Based on the City Directories and Lists of Residents, it appears that he nevertheless accepted lodgers. In May of 1943, he applied for (and subsequently received) permission to convert the property into a lodging house. Anthony Barone died in December of 1944. Mildred Barone continued to live and operate a lodging house at 214 Commonwealth. In October of 1946, the Building Department contacted Mildred Barone, who was a registered nurse, noting that the Health Department had advised them of her application to operate a “day nursery” at 214 Commonwealth, and indicating the need to obtain approval for this use and also to meet various safety requirements before the property could be used for a nursery. She appears to have abandoned her plans. In April of 1952, Mildred Barone applied for (and subsequently received) permission to convert the property from a lodging house into four apartments. On March 8, 1966, the Barones’ four daughters – Marjorie Olive (Barone) Laudano, the wife of Aurelio R. Laudano; Marilyn Gladys (Barone) Marks, the wife of Chester H. Marks, Jr.; Jacqueline Constance (Barone) Staffier, the former wife of Robert Joseph Staffier; and Carole Joan Barone – transferred their interests in 214 Commonwealth to their mother. Mildred Barone died in December of 1984 and left 214 Commonwealth to her daughters. In October of 1987, the four sisters applied for (and subsequently received) permission to legalize the occupancy as five apartments. Carole Barone died in August of 1988 and on February 14, 1989, her interest in the property was transferred by her estate to her three surviving sisters. Marilyn (Barone) Marks died in October of 1989, and her interest was inherited by her husband, Chester H. Marks, Jr.
On April 1, 1993, 214 Commonwealth was purchased by Magdalene Ippen. In June of 1993, she filed for (and subsequently received) permission to convert the property from five units to three units. On December 1, 1993, she converted the three units into condominium units, the Brownstone Condominium.